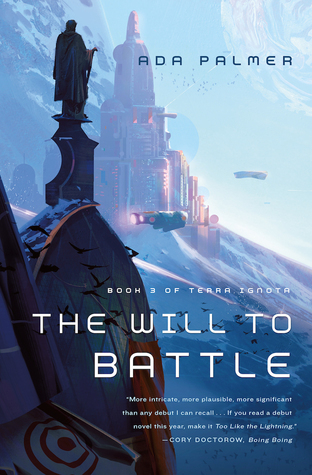 Provocative, political, philosophical and almost too clever for its own good, The Will to Battle is the third installment in Ada Palmer’s ambitious Terra Ignota quartet and, as a fan of this series from the beginning, I wasn’t disappointed at all. I won’t detail the plot too much because, at this point in the series, it’s so complicated that I would probably do a poor job. However, I will just disclose what the title already tells you about the book. This book is not about the battle but the will to battle: what precedes the battle and the calm before the storm. It is about the making of a war , it’s about preventing humanity from destroying itself, it’s also about the stars and the future of humanity beyond Earth. It’s about the ending of what was considered the perfect society. I feel like this series represents what speculative fiction does the best: make us rethink our vision of the world. This series is based on a very simple question: how would the world be if you could make a world tour in a few hours? You could live in Tokyo, work in New York and visit your friends in Russia in a day. In this world, borders wouldn’t mean anything and countries would be rendered obsolete. How the world would end up looking like if you could choose your government and your laws not just thanks to your geographical location but simply with your true political beliefs? In this utopian world where people have a complete choice of their leadership and values, live in peace and have access to universal education, healthcare and a world without crimes, what could draw you to war? This book explores this issue while discussing the consequences of such a war on the future of humanity. Indeed, at this point in time and with the technology available, this war could be the end of humanity. The Will to Battle is about leaders doing their best to prevent things from getting too ugly and too deadly while dealing with the issues that lead to the conflict. This idea of a war solely based on ideas and not geographical location is fascinating because, since borders don’t exist anymore, who are you supposed to fight against or with? As usual with Palmer’s work, this book features a ton of philosophical ideas and, as the war approaches, the philosophers mentionned become less and less idealistic, the first book heavily featured Voltaire, this one is much more focused on Hobbes. This book is also very much focused on politics and laws. It features a couple chapters solely based on laws that I personally found very interesting but I can understand why a few readers didn’t find them as compelling as I did since those passages were quite long and detailed. Some might find them too info-dumpy but I really liked how knowing about the law in this world allowed me to understand how it all worked. The Will to Battle took me just over a month to read and that’s not because I found it bad, on the contrary, I never wanted it to end. I just wanted to stay in this fascinating world and see how the events would unfold. The evolution of the events in this series are mindblowing and I am just amazed by the sheer scope of the story. I cannot wait to see how Palmer is going to end this quartet. This series was an achievement from book one and it keeps on getting better. 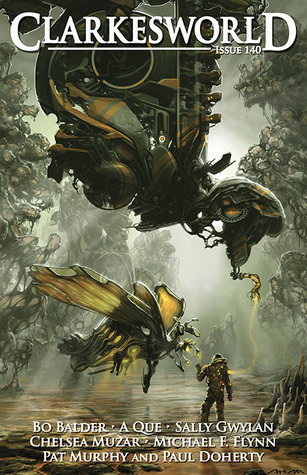 I feel like Palmer is pushing the boundaries of science fiction and what it can do. It’s now June and I feel like I say that every month but this year is going fast and I don’t seem to able to read much. 😦 Sometimes I wish I could go back to high schoolwhen I could easily read more than a hundred books a year, but sadly, it seems that I get less and less time to read… College is definitely time-consuming but I also struggle to make time to read when I can! Anyway, I still managed to read a bit more than two books so it’s not as bad as April! As you can see, most of what I read was pretty great so that’s very good! 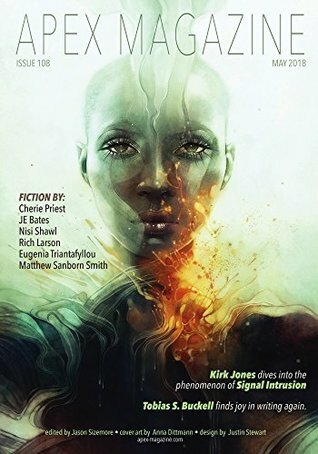 I have been getting back into short fiction after a couple of month of hiatus (I read a few anthologies but zero magazines). I re-started my subscription to Clarkesword and so far I don’t regret it (I read one story of the June issue and it was amazing so you can expect issue 141 to be in my June Wrap-Up!). I think I might start again my Short Fiction Sunday segment where I discuss the short stories I read recently. I will have a review of The Will to Battle coming up this month and spoiler alert, I freakin’ love that book. This series is getting weirder and more philosophical with each installment but I am definitely here for it! Also, as you can see, I’ve managed to yet again read Ninefox Gambit by Yoon Ha Lee, but, what can I say? I love those books and I will probably continue to regularly re-read them in the future as I find them even better each time! I am currently reading several thing at the same time as I usually do. To fully prepare myself for Revenant Gun, I am re-reading Raven Stratagem by Yoon Ha Lee (and as for Ninefox Gambit, I love it even more the second time!). I am also reading Spaceman in Bohemia by Jaroslav Kalfar and, to be honest, so far I don’t like it very much. The main character is a self-centered douche and I really don’t care about the story. I don’t even know if I will be able to finish it which saddens me because, I usually read Clarke shortlisted book in their entirety even when I’m not enjoying them very much. We’ll see if it gets better. The cover art is by Anna Duttman and you can check more of her art on her website here. Well it appeared that I had a lot of things to write for this update but how was your May? Any good books?